Sign Up for the Shed Weekly Digest! Sign up with your email address to receive #shedapproved recipes and our food and wellness journal for free! Preheat oven to 350°F. Cut sweet potato in half (lengthwise), and then into wedges. Toss with oil and spices. Bake for 30 minutes, flipping halfway, until crisp on the outside. First, let me proclaim my love of butternut squash. I think it is so much different and more interesting than normal yellow squash, or zucchini, pumpkin, or almost any other vegetable (technically fruit) in the gourd family. There is something about the flavor and texture that just gets me. I also think that it is a great starter squash for the health novice. It has enough flavor that, if you are open to new textures, is a perfect veggie to start with. Can we also talk about how versatile it is? It could be used in ravioli, soup, pie, or as a main like this recipe! It is also very filling, full of fiber, and countless phyto-nutrients! If you want to know more about the awesomeness that is butternut squash, check THIS out. This particular butternut squash I had bought without having any big plans for it, but I surprised myself with this gem of a concoction. I may have mentioned that I am descended from generations of Italian-Americans. I also spent 5 months living in Florence (one of the best life decisions ever- email/tweet me, if you ever want to talk about it. Full disclosure: good luck getting me to STOP talking about it). And pretty much my upbringing consisted of awesome Italian meals daily. My mom is an amazing cook, as was my grandmother, and if I inherit any of their skills in the kitchen all will be good in the world. All of that is my precursor to say that Italian food is my weakness and where my improvisational style lends towards the most. 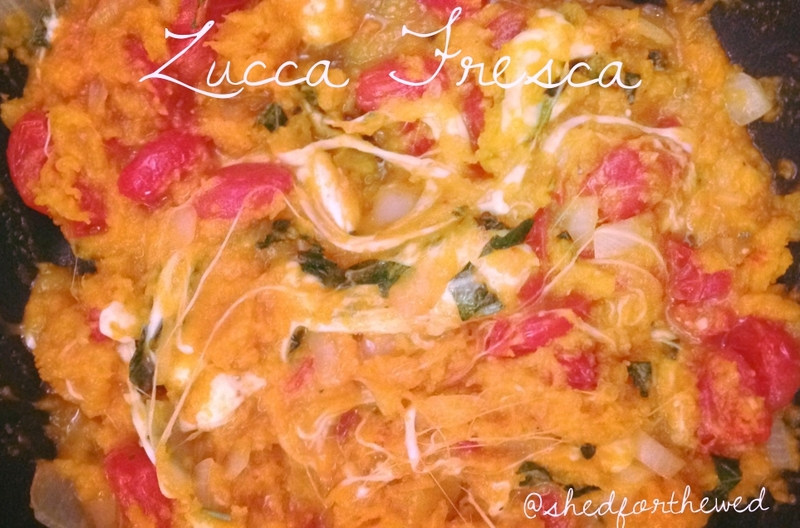 So naturally, this butternut squash is mixed with a variation on a cooked caprese salad. You really can’t go wrong with fresh mozzarella balls, tomatoes, and basil. This dish was absolutely delicious and I couldn’t stop eating it. Make this. Seriously, it will make your day better. I promise. Disclaimer: if you are at the back end of your shedding journey, I advise you to cut back on the mozzarella included. I would not eliminate it because it really adds a lot to the dish, but it does not need to be as cheesy as the recipe below. Brush cut sides of squash with 1 tablespoon of olive oil. Sprinkle with salt and pepper. Place squash halves, cut sides down, in a large baking dish. Prick all over with a fork. Bake, uncovered in a 375F degree oven for 30-40 minutes until tender. In a large skillet bring vegetable broth to a boil, add onion. Cook for about 3 minutes until tender. Remove skillet from heat. Add roasted tomatoes to skillet with onion. Gently press down on tomatoes to pop them (spatula works well!). Add mozzarella and basil to tomato mixture, toss well. Using a fork, scrape the squash from shell. Mix into skillet mixture. Serve hot!